I was using OSM tool to calculate driving distance between multiple starting postcode to single destination postcode but now OSM plugin is gone and ORS tool came in QGIS3.6. 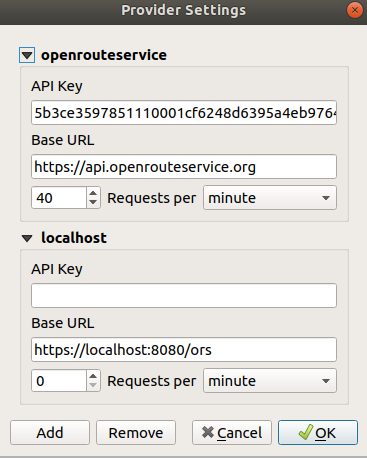 I can’t add API key, getting an error as could not convert string to float… and in OSM tool I used from layer and end layer to pass postcodes but there is no option coming up in ORS. Please help where things are wrong at my end. see the attached screenshot for error. and in OSM tool I used from layer and end layer to pass postcodes but there is no option coming up in ORS. see attached Python error details. Use the Map button to map coordinates to the GUI or use the batch processing tool. What exactly are you doing after the you set up the key in the ORS Tools settings dialog? Just pressing OK? Is this the screenshot just before you try to process a route? Error is coming while I am trying to insert API key,not trying to calculate anything. Uhh??! Ok, that IS weird. Haven’t heard that one before and I’m sure most users run Windows. Looking at the code, it’s impossible that this happens, since the Settings window has zero knowledge of the main plugin window, which is where your error comes from. So, you basically do this and as soon as you hit OK, it throws your error? Can you share the exact versions you’re using of Windows, QGIS and ORS Tools? Not sure I can anything about it at this point, since I likely don’t have access to the same config (running Ubuntu myself), but I do have an old Win 10 machine. I can try to get to it on the weekend. Ok, that cleared it up. Please be as precise next time. So you did try to run empty coordinates… Which happens if you just press the Apply button without actually setting any coordinates. This behavior did not change from OSM Tools. Now we’re talking. The response from the server is not JSON when you do batch, but actually should throw a better error. Can you pls email me the shp’s on nils@openrouteservice.org (zipped and telling me which is which)? Would be curious what caused it. So, after I finally got the right files, there is no error! Following your instructions I can successfully route from start to end layer. Apart from the fact, you’re trying to route from Massachusetts to UK, which can’t be found. Just to point this out again: you route from shapefiles, not from CSVs right? !